This blog has been alive for six years this month: both here and, previously, here. Six years worth of drivel has trickled from my fingers to clutter up the outer reaches of the hypernet. Nobody noticed for quite a long time, which was okay but blogging is much more fun when you are certain that somebody is reading the thing. What a sterling use of technology. Sometimes I wonder what will happen to all this stuff that we broadcast. Will any of it exist in fifty years time? Indeed, should it exist ? or should it just pop like floating soap bubbles colliding with a stationary hedgehog ? Will future historians ever show any interest in the billions of self-indulgent words that we have written? Who knows, but, almost every time I publish a blog post, it always strikes me as remarkable that it was only six hundred odd years ago that every individual book was laboriously copied out by monks with chilblained fingers and grubby habits. Each book cost a fortune and was mostly only seen by a handful of people, the subject matter was also somewhat limited being confined to religion. There was no illuminated detective fiction or saucy romance. Then Caxton and Gutenburg and that lot got going and soon the printed word was, while not exactly available to all, much more widespread. Nowadays any old sod can find an audience. Gone to listen to a recording of Gardeners Question Time in Spalding, Lincolnshire. My learned friend Nigel Colborn recently launched an impassioned defence of his home county but he skates over the bleakness of this particular area in favour of various wolds and luminaries such as Isaac Newton and Nicholas Parsons. There is nothing woldish about Spalding : unless your idea of an area of outstanding natural beauty includes heaps of sugar beet, concrete barns and ditches. Maybe I caught it on a bad day, in the wrong light or perhaps I missed the best bits.Anyway, when I got there the gloriously fragrant Matthew Wilson was on the panel so all was sunshine. It was interesting: I sat in a rather comfortable van with the sweetly scented Lucy Dichmont watching the broadcast while she uttered slight direction into the ear of Eric Robson. There was cake but not in the luxuriant quantities I had been led to expect. I am very admiring of the GQT panel: my mind kept going blank when I tried to come up with an answer and I was not even out there snuggling up to Bunny and Christine. It is one of those perennial problems that I have: as soon as somebody asks me a specific question like “What shall I plant in my dark moist corners?” (or something similar) I have a moment of blankness when all I can think of are plants that thrive in the windswept aridness of the high plains. Somehow the brain eventually re-engages and I start spouting about ferns. I have attended two meetings of the RHS Judging review panel. We are examining the show garden judging process which is interesting: we are also making progress which is excellent. There will be a public meeting in early February so that any interested parties can come and chip in their opinions. I have collected a new and rather spiffy suit (single breasted birdseye). I have organised some trees and seen assorted clients all of whom seem reasonably happy. Had a very fine lunch with Cinead from the English Garden. My daughter has become very keen on the idea of taxidermy. She has spent much of Christmas skinning things including nine moles and three squirrels. A skinned squirrel looks just like a rat. Errrrr….. that is about it really. Oh, and I am reaching the zenith of a very exciting project which will completely change the world of gardening media for ever. Details will follow very soon: please remain poised. I am listening to You’ll be Sorry One Day by Slim Harpo. 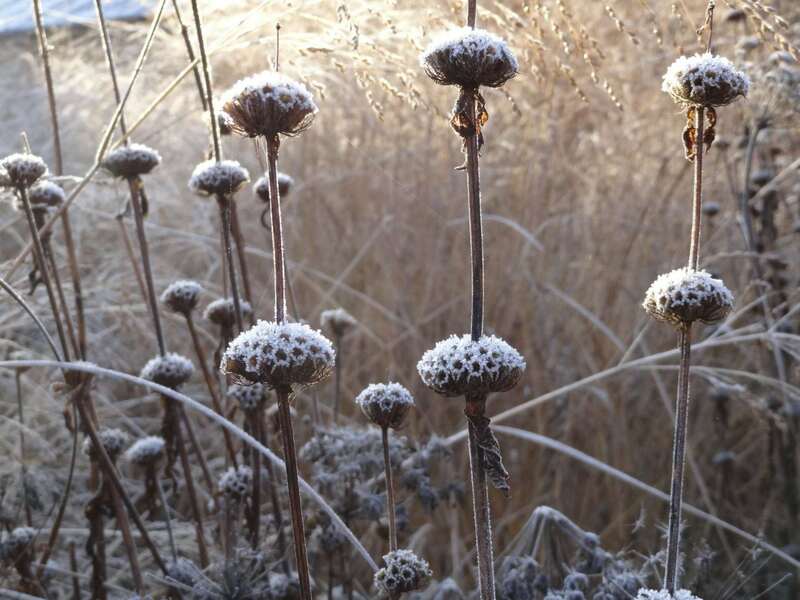 The picture is of a frosted Phlomis. Six years. You must have been one of the pioneers of this medium & now look at it, we are overwhelmed with choice. I remember, in a previous life, making the point (or at least trying to) that it was all very well every man & his dog bunging stuff onto t’interweb but there was no-one prepared to remove it. The consequence is that it will continue to grow like topsy making the retrieval of anything sensible, let alone original, damn nigh impossible. (Rant over). Great to hear the RHS are reviewing their judging criteria/process. Anything which helps to provide clarity & a level playing field will be a winner in my book. Will this be implemented this year ? Please do not misconstrue my melancholic rant. There are exceptions which will forever rise above the general morass. Both yours & James’s offerings fall firmly in this camp. Nicely retrieved. Have you been studying at the Sinclair School of Schmoozing? Your warblings, Ms Sock, will find their rightful place in the great libraries of the world. I would not be at all surprised if children as yet unconceived will be using your blog as a textbook in all decent schools. You’re right of course. There is nobody cleaning the Internet: nobody deleting stuff because it is out of date, irrelevant, rude, untidy or simply inept. There should be gangs of industrious staff mopping and dusting. If we are not careful it will be like that scene in Monty Python’s Meaning of Life when Terry Jones explodes. There will be a big bang and we will all be drenched with partially digested blog posts. Luckily I don’t think I’ve written very much on the interweb which anyone will particularly wish to retrieve in fifty years’ time, let alone 600, so I can subside into genteel obscurity once I’ve stopped wittering on about vegetables (that’ll be when I’m about 80 and losing my marbles, then). I started my blog only a year after your good self, so I’m five-and-a-half at the moment and there are vast quantities of blither on there which I’ve forgotten I ever wrote and suspect nobody has read since (if they ever did). Funnily enough it doesn’t bother me: perhaps a side-effect of having been a journalist for too long, therefore used to my weighty utterances disappearing into the mists of time. You will now be in trouble with Nigel Colborn and with Lucy Dichmont for complaining about her cakes. And I gave up being a gardening ‘expert’ (do hate the e-word) on BBC Radio Surrey for exactly the reasons you outline above: my mind kept going blank at the most inopportune moments and the urge to spout anything, as long as it was words, grew so overwhelming that I feared I would blow my cover and people would realise I’m not an Expert at all but just a jobbing gardener who doesn’t know anything about orchids. I sometimes look back at things I have written (either here or in print) and realise that I had completely forgotten writing the stuff. Odd, especially as it seemed so important at the time. Or maybe I am just succumbing to age related memory loss. I too know nothing about orchids but nor do I know much about leeks which is a bit more of a problem. I’m from Lincolnshire and I have to say, I have rather enjoyed the Colbornisation of the county (it’s a bit like gentrification but with more bite). Sadly, though, you tell the truth. I come from Boston (which shall henceforth be known as “the Ugly Spalding”). We dream of their glamourous concrete barns and sugar beet. The home of the Geoff Moulder Leisure Complex? Six years! Perhaps you might consider the occasional repeat of early blogs? If your daughter starts looking at you in an unusual manner, it’s time to make a swift exit! My brother has already agreed to allow her to stuff him after his demise so I am relieved of that responsibility! I congratulate you on your blog achievement & indeed any other achievement you might like to throw in to the congratulatory pot. I thoroughly enjoy reading your witty & erudite burblings so long may you continue. I have always said that you were a woman of immaculate taste and intellectual heft. in spite of what Arabella says. Congratulations James! I suspect that, in the same way each human year equals 7 cat years, there is a comparable equation on the techno front line – so your six years is probably actually 238 tech years. A venerable and veritable achievement. Your presence on this blog is always uplifting. Thank you. I am only sorry that Simian Suter has not yet tidied the internet in preparation for your noble visitation. It is equivalent to 4,000 terrayears or 4 shillings and sixpence. Ahem….this ‘sod’ is actually entering the eighth year of blogging i’ll have you know, so less of the back chat, newcomer. Interestingly (or otherwise) i am known in some circles as The Man Whose Friends All Have Novel Names, one of whom, Basher, now lives in Spalding. He was a cycle courier transporting, not, as you might imagine, business packages between vendor and customer, but in pedalling (in more ways than one) sizeable lumps of hashish to stockbrokers and bankers. Other than that, i confess, Spalding and its mother county remain largely a mystery to me. I do intend to remedy that at some point with a holiday week consisting largely of moody gazing out to sea. Its a shiny suit with foldy up sleeves isnt it, quite Peter Powell. Eight years? I knew you were much older that you look. Although you have to admit that the first couple of years your blog was mostly internet onanism: a fact that is reinforced by the rather pretentious use of lower case type in the earlier posts. Rubbish it may’ve been but the lower case wasn’t an affectation I’ll have you know…in transferring the blog from the old template to the current one the text lost the formatting. So there. Just as Ms Sock, I was feeling warm and fuzzy over the unctuous content, but became somewhat confused by the mention of Spalding in the comments. I seem to have been blinded by all the fuzz. Will read again… Ah, the location of GQT. Apologies,seem to have overlooked the obvious significance there. I plead Continental ignorance. Anyway, what I wanted to say was happy blog birthday James, may there be many more years of drivel…! ps.. perhaps time to incorporate (archive) old blog into current? 6 years? Now that is impressive! Mine feels like a spring lamb compared; 4 years. I’ve been trying to think of something erudite to say on the subject of blogging, but failed miserably, so I will just wish you a belated happy blogaversary, James – here’s to many more years of your very enjoyable drivel. Me too, James – I love your blog, so please carry on until your eyesight fails and your brain fogs over! I’m sure you would have something to say even from the confines of your carehome. Don’t you just hate it when a blog that you love is suddenly wiped? Um – hello back. Are you hibernating? If so, it looks a case of slightly precocious Delusional Groundhoggery, given the date he emerged from his burrow to sniff the air. ooooooh, I just found your blog and I am in love with your writing. So English, so delightful and your photograghs aren’t too shabby either. Please count me in as a regular, you fine English gent you. How kind of you to drop by: would be delighted to see you back here anytime.